Our advice is free because our mission is to provide education so you can make the best decision for your health care needs. We believe that you should get all you deserve from the Medicare system, you earned it. ICUSA represents all Medicare insurance companies like Humana Medicare, AARP Medicare, Blue Cross and Aetna so we educate you on all your choices, then you can pick the best option. Our Medicare consultants work with you to help navigate the mysteries of Medicare. A major part of that consulting is providing Medicare education and solutions to thousands of retirees. We partner with companies like Farmers insurance and Edward Jones to assist their clients in navigating the Medicare system and selecting the best solutions. If you are looking for qualified unbiased assistance please attend one of our weekly workshops to find out more about your Medicare options. Or give us a call and set an appointment for an individual meeting. We specialize in Medicare supplements in Denton and all of the DFW area. Our caring agents provide lifetime service for your Medicare insurance policy. This means when claims occur, you are not alone. You will have our experts on hand to help you sort through the issues. Plus we will assist you every year by explaining the changes with Medicare and with your Medicare plans to make sure you continue to have the best plan available. Part D drug plans change every year also and our team is here to review your drug plan coverage every year. Many times we find that your current policy is still the best one for you next year. Sometimes, however, we locate considerable savings, so it’s always worthwhile to have us check for you every fall. 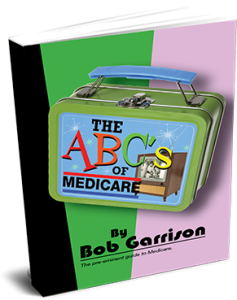 Get Bob’s new book, The ABC’s of Medicare, for free when you fill out the form below! People just turning 65 or those who are over 65 but have been working and are now ready to retire most often have many questions and concerns about Medicare. You need to be aware that certain steps must be taken when signing up for Medicare to avoid any Medicare penalties. We can help you take those steps. What is Medicare and what will it cover? Do I need to buy additional Medicare supplements or is just Medicare enough? When should I enroll and how is the best way to do it? What is this prescription drug plan I have heard about and how does that work? First: You must enroll in Medicare part A and B, you can usually do this online by going to Social Security. Gov. However, if you already have part A and just need to enroll for part B, you will need additional forms and may need to visit the social security office in person. Each situation can be different. Next find a qualified independent advisor to assist you in this process and help with finding the best Medicare supplement and Part D drug plan that works for you. Our agency offers workshops every month that teach people on the basics of Medicare, and our team of advisors assists people on an individual basis by appointment. Most folks are skeptical of Medicare and think their old health insurance is better. Not true, if you package Medicare together with the correct supplement plan and Part D drug plan you have great insurance coverage. So, how does Medicare work? It is different from your traditional health insurance because it comes in parts. Part A is essentially hospital insurance. After a per-occurrence deductible of $1,288 is met Part A helps cover inpatient hospital care. Part B covers Physicians, tests and labs etc. After a yearly deductible of $166 part B covers about 80% of all the charges. Part B has a monthly cost and is deducted from your social security payments. The standard rate is $121.80 per month but that depends on your past income, it could be higher. Part D is the prescription drug plan. It helps cover the cost of prescription drugs. The average cost of a Part D plan is $32.50 per month. The Part D plans are much more complicated however, there are coverage gaps and deductibles and specific formularies. You can go to Medicare.gov and find a list of the plans available in your area. Part C refers to a Medicare Advantage plan. This is where your Medicare benefits are transferred to a third party insurance company. Call us for more information on the Advantage plans, we represent all the plans available in your area so we can help you sort through the maze. The most common supplemental plans provide coverage for your out-of-pocket expenses not paid by Medicare, such as copays, deductibles, coinsurance, as well as some services that may not be covered by Medicare, such as international travel emergencies. Plans vary, so look for a plan that provides the coverage you need. Medicare supplement plans are sold by private insurance companies, and you will usually pay a monthly premium. The cost of Medicare supplement plans can vary due to a number of factors, including the plan’s service area, the age you were when enrolling in Medicare or the age you currently are when enrolling in a Medicare supplement plan. Because premiums and out-of-pocket costs can vary, it is a good idea to shop around to ensure you find the best rate and policy to suit your needs. With a Medicare Advantage Plan, sometimes referred to as Part C, your Medicare benefits are transferred to a third party insurance company. Medicare pays the insurance company a flat rate when you enroll, the insurance company then pays for the cost of your care. Advantage Plans typically have co-pays for each service provided, like a Physician office visit could have a co-pay of $30.00 for example. However, in a worst case scenario you have a maximum out of Pocket that can’t exceed $6,700 per year. The reason many people choose a Medicare Advantage plan is because of cost. Generally, Medicare Advantage plans are less expensive than Medicare supplement plans. Advantage plans range in cost from $0 to $120 depending on the plan and the network. When shopping for this type of insurance coverage, you have a lot of options. Choosing the coverage that is right for you will require matching up the plan that best fits with your specific insurance protection needs. While there is a lot of information about Medigap available, it is often best to work through your options with someone who knows this area well and who can help you to narrow down the policy that’s best for you. For additional information on insurance quotes and how to cover the out-of-pocket costs that are associated with Medicare, Texas, Washington, and New Mexico residents should call or visit the nearest Insurance Connection USA location today. by enrolling people in Medicare.